Back in 2013, I was fortunate enough to have been brought into Comicosity by Aaron Long and Matthew Santori after I pitched an idea to them for this column series. To this day, I am not positive what made Aaron and Matthew take a risk on my writing, but I cannot express how thankful I have been all these years later. One of the first columns I wrote was entitled “Beyond Good and Evil.” At the time, I ever-so-briefly got to talk about Dr. Doom and how I saw some parallels with the character of Heathcliff from Wuthering Heights by Emily Brontë. These were the kinds of things Aaron allowed me to put out, and I cannot ever genuinely thank him enough for the material he has allowed me the chance to generate. The tag line on the Comicosity website reads as “If you leave here loving comics just a little more than when you arrived, we’ve done our job.” Aaron gave me the chance to try and talk about comics in a way that was a little more than casual chatter, but it was also certainly nothing like standard academic writing (i.e. needing lengthy citations, peer review assessments, etc.). I want people to love comics as something deeper than I was raised to believe they were, that they were not “just” cartoonish, clunky stories about people in capes. Many readers on this site know the range of topics comics can over, but not everyone gets to encounter a book that can, even briefly, touch on the depths of human emotion that makes life worth living. A phrase I heard once was “literature is a path to religion for the non-religious,” and I basically agree with the premise. Textual objects of all kinds can become pathways helping others understand pain, happiness, enlightenment, mercy, peace and even love. What we do with the lessons from those texts are among the most vital decisions in our lives because they’re 100% on us. If we read something, and we are moved to understand pain and mercy, what does it mean then if we don’t comfort others or extend mercy to those who may not be considered worthy of it? Aaron, and every other reader: I’d like to share with you how a very amazing comic opened my eyes to empathy — and which still influences me today. This is especially true in our current political climate, where many subjects incite immediate condemnation against those who speak out from a desire for revolution and against those who speak out from a desire to maintain the status quo. 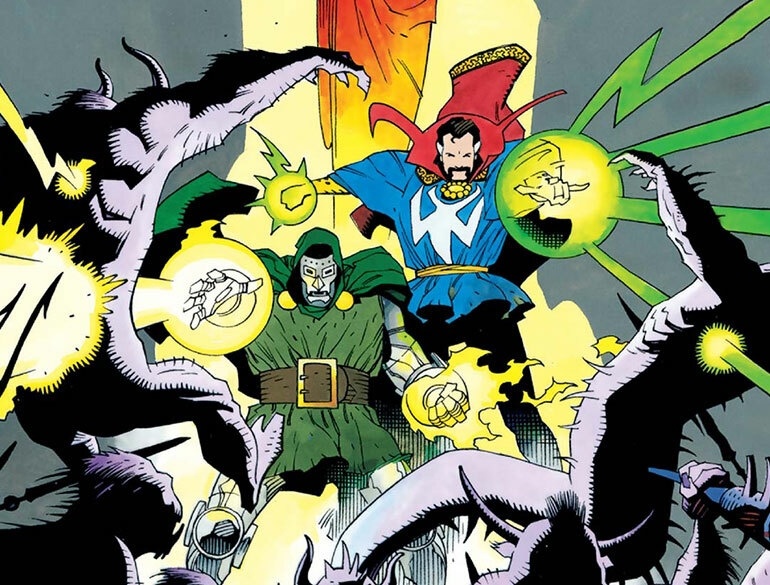 I cannot recall when it was I first got to pick up Doctor Strange & Doctor Doom – Triumph and Torment, but it was one of the books that made me appreciate the layers of complexity that were capable of being written beneath the mask of Dr. Doom. Before this comic, I had always appreciated the character, but what I appreciated most was his blatant and unapologetic antagonism of the Fantastic Four. I genuinely loved how much he hated them — Reed Richards in particular — and I consider his greatest attempt to undo his foe to be the Fantastic Four vs The X-Men mini-series arc from 1987 by Chris Claremont. Still, I had yet to genuinely discover the depths of Doom’s character. 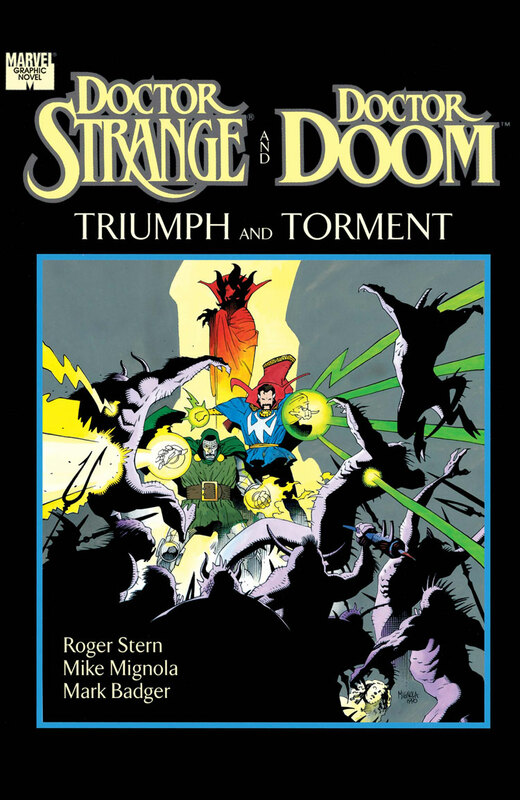 The appeal of the comic is the simplicity of the plot which Roger Stern throws Dr. Doom and Dr. Strange into. 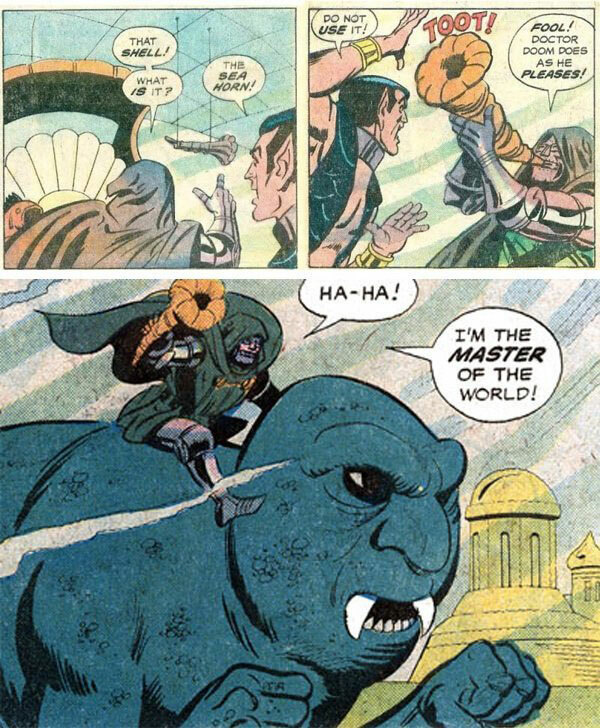 Strange, having bested a mystical trial alongside a group of other mystics (a group which includes Doom), is bound by an oath to serve the wish of the second place victor in the trial … none other than Doom himself. 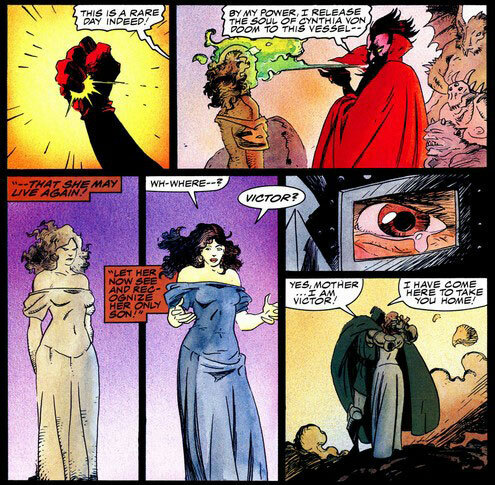 Doom only makes one request: to have Strange help him free the soul of his mother, Cynthia Von Doom, which is held by Mephisto. I think, even now, it is a huge risk to take a character like Doom and make him sympathetic in any light. 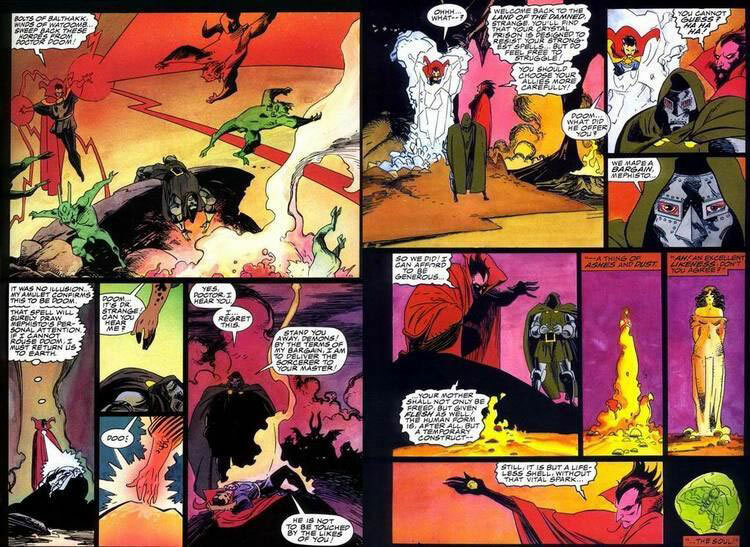 At the time when I first heard about the story (but, before I actually read it) I was interested more in Strange and Doom confronting Mephisto than I was about any possible moral complexity being folded into what little I knew of Doom’s character. Doom was best, as I saw it then, as a villain. Doom had always been a polite antagonist, but for the most part (Valeria not withstanding) he was the Marvel antagonist. Then, once I got my hands on a physical version of the comic, I experienced what is probably among my favorite comics of all time. 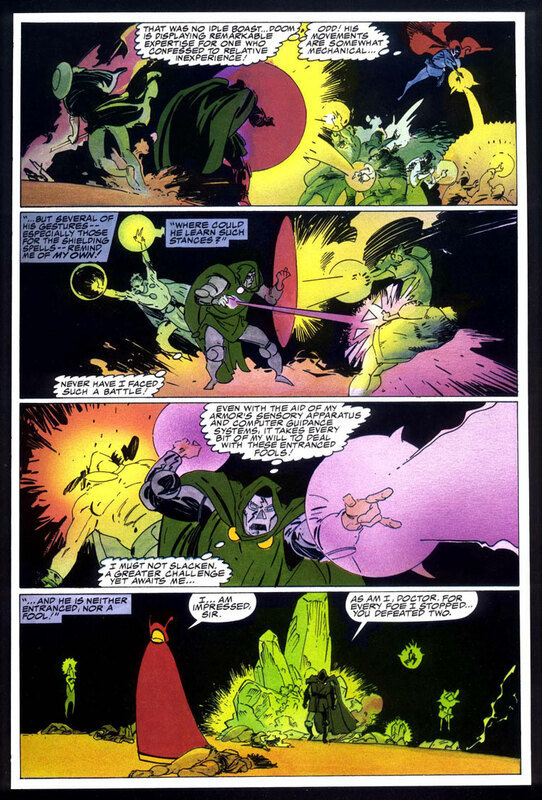 The simplicity of the plot hides the utter range of things Stern includes in the story that force readers, like Strange, to consider Doom as a wounded, bitter person. I emphasize the word “person” because I had only ever come across certain incarnations of Doom at that point, and every one of them was many things: polite, noble, proud, deceitful, vain … but he was always on some level a villain, a character who, regardless of how polite he minced words, he would ultimately try and destroy you. Now, despite these things, Stern does not have Doom change. 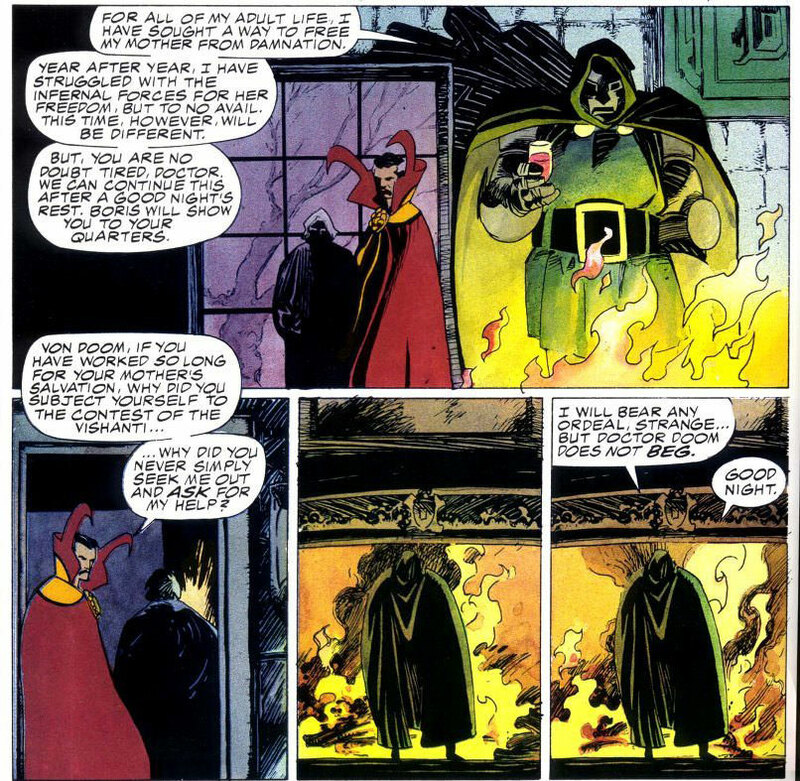 Doom, upon saving his mother’s soul, rejects Strange’s company and seems to allow himself to return to being the steel-faced dictator Strange accuses him of being at the comic’s start. This is the part I always found perplexing: what am I supposed to feel for Doom at the end? I can see his narrative is one which Stern defines by grief and loss, yet Doom clearly rejects love unless it comes from subjugation. He is told by Strange that he could have always asked for help, he didn’t need to have earned Strange’s boon to get aid. Doom comments such a thing would be begging. Doom, at the last moments of the comic, revels in his pain and grief. It is challenging to accept him as being a different character, because he isn’t. He remains Doom, however what has changed in my knowledge of his past. If Doom cannot, or will not, change, what do I do? As far as my reading, I cannot accept Doom as a villain in the same way I did before, but I also cannot say I now ‘forgive’ all the times he has done truly horrific things to Marvel characters. What I can do is accept that Stern’s writing made me feel empathy for a dictator. No, Doom isn’t real, and I hope I am not explicitly saying we should all go out and start trying to feel empathy for those who slander communities we value, or who decry the rights that so many have fought for. What I am saying is that writers like Stern, in a comic book about a man who slings silly-termed magic words alongside another man in a magical/mechanical suit who fights the not-Devil, gave me an empathetic feeling for a genuinely horrific character. Remember, I don’t condone Doom’s genocidal, maniacal schemes just because Stern wrote a darn good story that tugged on my heart-strings. The ability to empathize is not an easy skill, and should admit that it is easier to do for non-real characters whose existence does not actually impact the very real world I live in. I daily have to find ways to balance out my concerns for how I think about those whose views I don’t share. As an American citizen, I’ll admit right now that there are outlets in many cases to contest the views I disagree with and, for the most part, the majority of those systems function. But, seriously: empathy is hard. I think, at the risk of seeming hyperbolic, empathy might be the hardest thing to understand because it forces us to admit the frailty and weakness of people. My challenge has been, and in fact remains, figuring out how to channel and engage with other people in a civil manner, even (or, especially) if and when I disagree with them. All in all, I’d say those questions are sometimes hard to tackle, but they worth tackling. I don’t have all the answers. Stern’s comic does not wrap up with Strange or Doom coming to terms with anything, it simply ends. The real challenge is on the reader, to make sense of the issues raised in the work and to then do … something … with them. What that is, for every person, is different. Aaron, thank you for having afforded me the chance to talk about these kinds of issues all those years ago. Thank you for having taken so many chances on so many writers and for having helped make Comicosity what it is today. We’re pretty sure former EIC Aaron Long rides sea monsters across the wilds of Canada, too.